CANTON, Mass. – Stoughton senior Jeff Grier was mostly a spectator during last year’s Thanksgiving game against rival Canton, a game the Bulldogs ran away with. After not getting a carry on the holiday as a junior, Grier wanted to make the most of his opportunity this time around. The senior delivered, and in a big way. Grier had 15 carries for 211 yards and scored three touchdowns to pace the Black Knights to a 28-7 win over the Bulldogs in the 93rd annual meeting on Thanksgiving. Grier entered his final season as the top home run threat type running back in the Hockomock, capable of breaking off a big play on any carry. 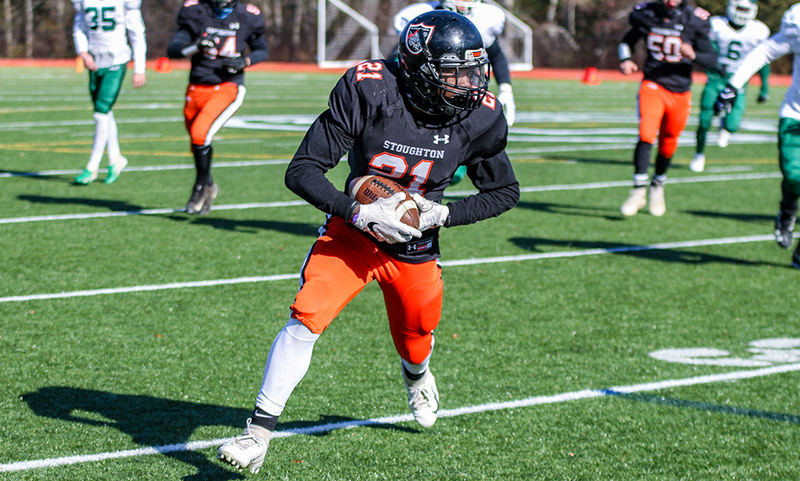 But injuries hampered his season, and Stoughton head coach Greg Burke said Thursday morning was the first time his starting running back was fully healthy all season. “We played hard today, Grier got going – this is the first week he’s been healthy, and he’s a great kid,” Burke said. “The line played well, we don’t have the biggest line but they are tough, we have some tough kids. The teams were tied 7-7 at halftime before Grier went off in the second half with three unanswered scores to lead the way. It took the Stoughton offense very little time to take its first lead of the game. After receiving the kick off to begin the second half, the Black Knights needed just two plays. On 2nd and 13, Grier came across the formation on a counter, found a small hole, burst through it and raced his way to a 66-yard touchdown. Josh Cocchi made all four of his extra points on the day, this one putting Stoughton up 14-7 with 10:02 left in the third quarter. Canton’s offense took the field and looked primed to respond with a strong drive of their own. Highlighted by a 20-yard run from Kyle Fitzgerald (10 carries, 49 yards), the Bulldogs moved to the Stoughton 25-yard line. But Stoughton’s defense clamped down, holding Canton to a short gain on first down, getting an incomplete pass on second down, and Savion Scott coming up with a big sack on third down. The Black Knights forced a turnover on downs with an incomplete pass on fourth. The Black Knights offense went back to work, using a strong ground game to move up the field. Christian Ais (65 all purpose yards) had a 19 yard run and Alex Iverson followed with 15 more yards to get to the Canton 33-yard line. On second down, sophomore quarterback John Burke (3-for-3, 68 yards) connected with Christopher Ais for 16 yards. On the next play, Grier fought his way through a tackle and found the end zone on an 18-yard carry. Stoughton led 21-7 with 1:45 left in the third quarter. “We’ve played hard the last couple of weeks, we’ve just turned the ball over too many times,” Burke said. “We’ve played some tough teams this year, we’ve been up and down. I’m just happy for these guys that we finished strong today, it’s really rewarding for all they’ve been through this year. Stoughton’s defense forced a three and out but Canton’s defense answered with the same, with Brendan Albert coming up with a big nine-yard tackle for loss on third down to force a Stoughton punt. The Black Knights’ defense didn’t allow Canton’s offense to get going at all, with Evan Jackman and Jacob Brisson combining to stop a runner for no gain on second down, and Christian Georges batting down a third-down pass at the line of scrimmage to force a punt. Stoughton’s next offensive possession was short lived as Albert came from behind to knock the ball free and the Bulldogs recovered. But on the first play of the ensuing drive, Canton junior quarterback Johnny Hagan was picked off on a deep pass by Stoughton junior Anthony Pizzano with 6:00 left in the game. “We kept those guys in check, they’ve been running all over people,” Burke said. “We did well today [on defense]. We kept it simple, used our simplest defense. We had to make sure that [Hagan] doesn’t kill you. We had a couple of spies on him every play, you have to. He’s a guy where nothing is happening on a play and all of a sudden he’s in the end zone. Facing a 3rd and 14 at its own 28, Stoughton elected to keep the ball on the ground to kill more clock but Grier was able to turn the corner and get up field and no one was able to catch him as he sprinted for a 72-yard score and a 28-7 lead with 4:34 to play. Canton scored the first touchdown of the day. After punting on the opening drive, the Bulldogs got the ball back after stopping Stoughton’s offense and fake punt attempt. Canton took advantage of the short field and on fourth down, Hagan hit Fitzgerald for a 30-yard touchdown. Owen Lehane’s extra point made it 7-0 with 9:20 left in the first quarter. Stoughton tied the game late in the first half. After stalling on its first two drives, the Black Knights went to the air to get things going offensively. Burke hit Christian Ais out of the backfield for a 48-yard pass, down to the 1-yard line. From there, Burke pushed it in himself and tied the game 7-7 with 1:45 left in the second quarter. Stoughton football finishes the season 4-7 while Canton closes out 2018 with an 8-3 record.